Back in April 2018 MarketingCharts.com published an analysis of billions of video ad impressions on desktop, mobile and tablet from 2015 through to 2017. 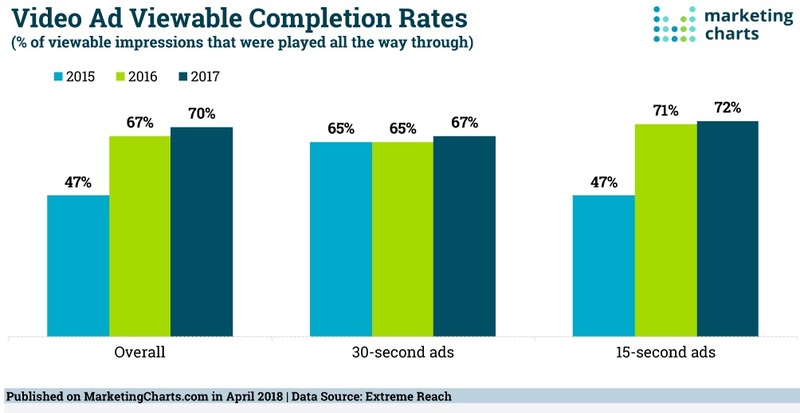 They found that video ad completion rates have steadily increased over the past few years, and as of 2017, overall completion rates were up to 70% — a drastic improvement from the 47% average just two years prior. Extreme Reach’s Q1 2017 Video Benchmark Report revealed that the average video CTR increased to 0.45% up from 0.35% in 2016. As consumers become more familiar with video advertising, more of them are clicking to learn more about the content they see. Get your key message across in 5 seconds and make your CTA appear at the 5 second mark. This will give the user two options: to skip or to click on your CTA. Add a teaser text that appears at the same time as the skip button is enabled, for example, ‘Get a discount code at the end of the video’ or ‘You are about to see a secret revealed’ to keep the user watching the video to the end. Make sure you use an ad network’s deep targeting features to ensure that the video is relevant to the user you are targeting. That way you are guaranteed interest from the end user, so he will be less likely to click the skip button. You could also target ads when a newsworthy event happens regionally, for example, suppose you are promoting a hay fever relief product and the news is that the pollen count will be really high in London that day. Select regional targeting so that your video is viewed by Londoners. And remember, you can also implement pixel tracking to retarget a user who has already clicked on your video. Stop showing the same video. If a visitor views an ad several times and still hasn’t clicked on your CTA, stop showing that ad. Put a frequency cap on three or four views, across any device, and then begin to show a different ad. Following on from the above point, you could create a series of ads with each ad being part of a bigger story. Think of it as a mini soap opera with a cliffhanger ending at the end of each ad. For example, the theme of each ad could be a different use of the product or a different product feature. Get creative and get your audience hooked and looking forward to seeing the next ad in your series. If you think outside of the box, those users might never skip your video ad again!